When injured due to a criminal offense in Dania Beach, the best things you can do for your chances of recovering damages is to call the best Dania Beach crime victim lawyer you can locate. Recovery of damages is possible, but it is a complex task. Our Dania Beach crime victim attorneys are available to help good folks from Dania Beach who suffered through criminal attacks. Call us at (305) 285-1115 for free consultations and remember, we never take a fee unless and until we make a recovery for you. 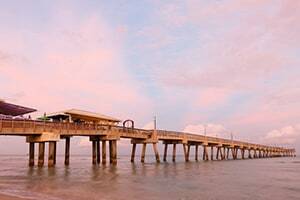 Dania Beach is a small city in South Florida that used to be known as a “Tomato Capital of the World” decades ago, but nowadays, is widely-known for its casino, jai-alai and antique shops. The city was called Modello in late 19th century but was renamed in early 20th century in honor of its mostly Danish population. Dania Beach borders with the Atlantic Ocean to the east, Fort Lauderdale to the north, and Hollywood to the south. Needless to say, these are just the most common criminal accidents leading to personal injuries that our Dania Beach injury attorneys have seen, but we may be able to help you if you’ve been injured in a different kind of crime. Call us for your free consultation today. As with any other place in Florida, getting injured due to a criminal offense in Dania Beach means you have three ways to recover for damages. You have the option to go to the Florida Bureau of Victim Compensation. There are requirements set by law that you need to meet, and if you do, you can apply with supporting documentation for compensation. This avenue can assist with recovery of economic losses such as lost wages and medical bills. The other one requires waiting for the end of the criminal proceedings against the offender who injured you. If he is taken to court and proven guilty, then he will likely be liable to pay for the damages caused. The problem is most criminals will not, or cannot, pay for the full extent of their damages. Finally, if the crime has occurred on premises of third parties, these companies, corporations or persons might be legally responsible to pay for your damages. These persons include, but are not limited to convenience stores, gas stations, hotels and resorts, bars, casinos and other places that invite guests. They must reasonably provide a safe environment for visitors, which means taking all reasonable measures for preventing foreseeable crimes on their premises. If this obligation is breached, most often due to negligent or inadequate security, and it leads to a death or an injury-causing crime, the third party may be responsible for your damages. If you’ve been injured as crime victim or you are a murder survivor, let our Dania Beach crime victim lawyers at the Wolfson Law Firm help you get the justice and compensation that you deserve. It can tough to recover from those who are liable for your injuries, so get the best team of professionals you can find. At the Wolfson Law Firm, our consultations are free, and you pay no fees unless we recover for you. You can reach us anytime at (305) 285-1115.